Videos, worksheets, solutions, and activities to help Algebra students learn how to solve word problems that involve investments. 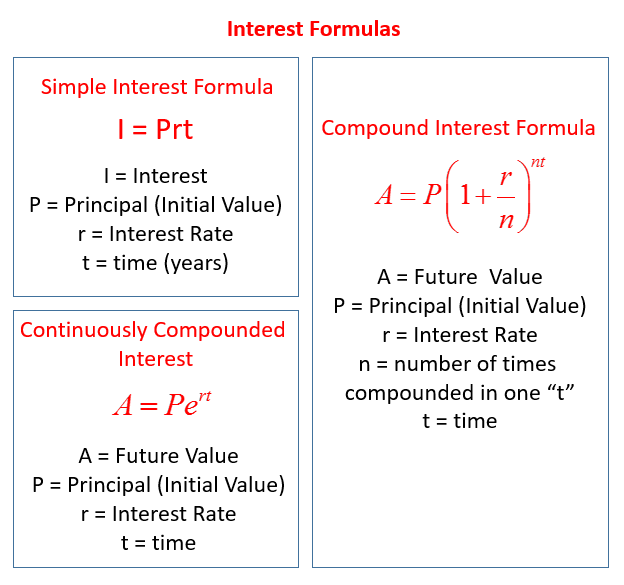 The following figure gives the Interest Formulas for Simple Interest, Compounded Interest, and Continuously Compounded Interest. Scroll down the page for examples and solutions of using the formulas to solve investment word problems. At the end of 2 years, P dollars invested at an interest r compounded annually increases to an amount, A dollars, given by A = P(1 + r)2. Find the interest rate if $2,000 increased to $2,420 in 2 years. Write the answer as a percent. Mary invested a certain amount of money at a 10% interest rate and $2000 more than that at a 12% interest rate. Her total yearly interest earned is $1340. How much money did she invest at each rate? A total of $6000 was invested, a portion at 6% and the remainder at 8%. The total amount of interest earned was $450. How much was invested at each rate? A sum of $4000 is to be invested in 2 portions, on at 4%, the other at 6%. If the interest earned with the portion at 4% exceeds the interest earned by the portion at 6% by $40, how much is invested at each rate? How to solve an investment application problem using a system of equations? Jolene invests her savings in two bank accounts, one paying 3% and the other paying 8% simple interest per year. She puts twice as much in the lower-yielding account because it is less risky. Her annual interest is $526. How much did she invest at each rate? If you deposit money into two different accounts and earn so much from each one given a certain interest rate, how much did you deposit in each account? Abby has $600 which she divides between two savings accounts. One account earns 5% simple interest, which the other earns 3% simple interest. If she earns $25 in interest total, how much did she earn from each account? 1. A total of $6000 is invested, part at 8% and part at 12%. How much is invested at each rate if the annual interest is $620? 2. Norman has a certain amount of money invested at 5% and $500 more than twice that amount invested at 7%. His total interest is $187. How much is invested at each rate? 3. $8,000 is invested, part at 15% and part at 12%. If the annual income from the 15% investment exceeds the income from the 12% investment by $66, how much is invested at each rate? 4. James has 2 investment accounts. One pays 6% and the other pays 10%. He has $1000 more in the 10% account than he has in the 6% account. The interest from the 10% account exceeds the interest from the 6% account by $260 each year. How much is in each account?